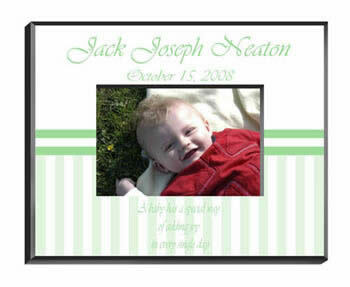 Perfect for a boy or a girl, this delicate green-striped photo frame reminds the recipient of the joy each baby brings to the lives of others. The pretty pastel colors brighten any room in the house. Our personalized frames are perfect for your favorite picture. They make great room decorations and keepsakes. Frames measure 8" x 10" and hold a 4" x 6" photo. Personalize this frame with a name.